Project ECHO® is a lifelong learning and guided practice model that revolutionizes medical education and exponentially increases workforce capacity to provide best-practice specialty care and reduce health disparities. The heart of the ECHO model™ is its hub-and-spoke knowledge-sharing networks, led by expert teams who use multi-point videoconferencing to conduct virtual clinics with community providers. In this way, primary care doctors, nurses, and other clinicians learn to provide excellent specialty care to patients in their own communities (© 2018 Project ECHO The University of New Mexico). 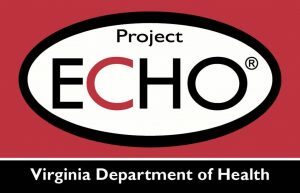 The success of the ECHO model™ has provided The Virginia Department of Health (VDH) Injury and Violence Prevention Program with a framework to implement a collaborative practice and continuing education model to address the burden of injury and violence and increase the capacity for healthcare providers and prevention professionals to care for impacted families. For more information, contact Lisa Wooten, MPH, BSN, RN, VDH Injury and Violence Prevention Program Supervisor or Jean Hoyt, CMA, VDH Injury and Violence Prevention Program Specialist.